A team of engineers and scientists has made use of the same element in its perfect crystalline form - graphene - to create world's thinnest light bulb. It is merely one atom thick and covers an area that is too small to be seen by naked eye, however, generates light bright enough that it can be seen with the naked eye. In the new study, the scientists used strips of graphene a few microns across and from 6.5 to 14 microns in length, each spanning a trench of silicon like a bridge. (A micron is one-millionth of a meter, where a hair is about 90 microns thick.) An electrode was attached to the ends of each graphene strip. 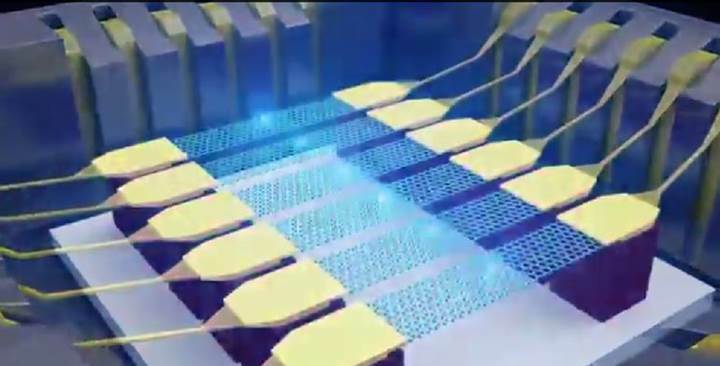 Just like tungsten, run a current through graphene and the material will light up. But there is an added twist, as graphene conducts heat less efficiently as temperature increases, which means the heat stays in a spot in the center, rather than being relatively evenly distributed as in a tungsten filament.